Art is not something just randomly drawn on paper. But it is like a photograph, to take something and make it alive on the piece that you are drawing. 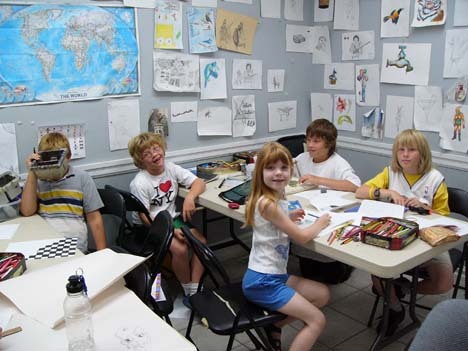 Bronte Art Academy provides lessons to both children and adults who are interested in Art. Come and join our family at the Bronte Art Academy. Art Instruction by Oakville portrait artist Paul Ross Sandilands. Portraits include Ann Mulvale, Gary Carr, Otto Jelnik. Taught at the Ontario College of Art and mentored by Deece Doran. Painting companion to well known Canadian artist, Harold Towne. Paul, as a portrait artist, is also able to paint in a number of styles, from Rubens to Renoir. Children to young adult classes are available 4-8 p.m. Tuesday through Friday, 9-2p.m. Saturday. There is no MINIMUM class size, but the MAXIMUM is 3 individuals to allow for a complete one on one environment between the student and instructor. All are mediums taught — watercolours, graphite, prismacolour, acrylics, etc. All materials are non-toxic and contain no solvents. Information required: Name, Address, Email, Postal Code, Telephone Number, Age , and Day(s) Required. Please note: a 3 month commitment gives you a 15% discount. Call to inquire of any necessary exceptions.